What Will be the Future of Web Development Sector? The web development industry has been an ever-evolving industry where technology surprises us every moment with a new update. Every day hundreds of apps are launched with a whole new set of features. Alongside, customers are expecting more features and better experiences. This has become challenging for web development companies to understand users demand and to work efficiently to fulfill it. 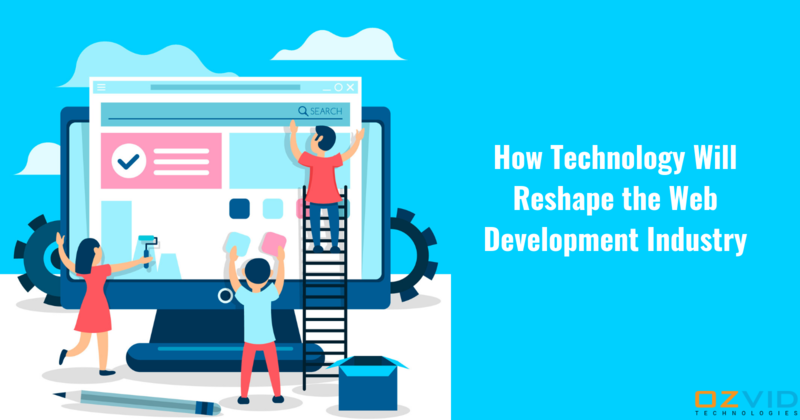 With the evolving technology trends and advancement in the web development sector, there arose a high demand of more and more web applications to meet the industry needs. To meet up the requirements, there are numerous web development companies which have been successfully delivering the utmost web development services and thus satisfying the customers. Despite all these efforts, there are cases where the websites are developed with the latest technology features, but fail to load pages quickly. At this point, it becomes necessary that you become aware of the latest trends which are going to overpower the industry and help in enhancing the customer experience and reaching their expectation level too. So, here is a rundown of top trends in the web development sector for this year. Whenever we talk about the trends which are under spotlight, we count artificial intelligence at the top. Isn't it? And that's true. Artificial intelligence industry has actually experienced a major transformation and has a lot for us. More and more companies are welcoming AI into their framework and are adopting it without any second thoughts. The main things under AI will include acting, assessing, predicting, sensing, and reasoning. As per Gartner reports, by 2021, 70 percent of organizations will assist their employees’ productivity by integrating AI in the workplace. When we talk about websites, it has two types- one-page setups and multi-page affairs. And as customers expect less text over your website, you can implement single page applications to enhance their experience. The top reason for choosing SPAs is its simplicity, there is no complex navigation for the users. SPAs will support its access over smartphones and even desktops. Moreover, it has proved out to be one of the inexpensive methods to satisfy your user needs. No doubt, bitcoins gained huge popularity in the last year, but this is just the beginning. Blockchain has a lot more to present you in 2019. It will offer more safe and secure transactions for users on which they can rely completely. Large enterprises are looking forward to integrate blockchain into their architecture in order to safeguard the user's sensitive data. Progressive web apps appear like a web application to the users, but they are actually web pages or websites. The main motto behind PWA is to deliver the native-like experiences to the customers. Moreover, PWA is focusing on offering full-screen experience to the users and implementing push notification to make this happen. Despite the website has an appealing design, if your website has difficult to locate features, it's just pointless spending so much on the design. So, UI has moved forward to simplify the user experience while keeping the website simple and easy to understand for the users. This will let you create websites which are simple, safe, inexpensive, and quick to load. Similar to mobile apps, even websites with push notifications can assist you in targetting a wider audience and gain a name in the market. Industry makers can easily share their special offers and discounts to the customers via push notifications and gain their attention. But remember, overuse of this might put a negative impression on their mind that result in lose of their interest and hence decrease the chance of their revisit. Above are the top trends which are expected to overrule the web development industry this year. Still, if you have any queries, our expert developers can assist you with it. You can get in touch with us and get assistance from our experts anytime.